Search Engine Optimization (SEO) is the practice of increasing the quality and quantity of visitors to your website and other online marketing channels. In short, having a strong SEO presence means you are being found by the right people at the right time, without having to pay for online advertising. Rarely does having a strong local SEO presence happen by accident. Local SEO (optimizing your online marketing channels so users nearby can discover your products or services) is becoming increasingly important in this mobile era. Consumers are increasingly using their mobile phones to search for products and services nearby. In fact, 88% of users use their smartphone to make such searches (source). If you want to compete with other local businesses, you have to make sure your website and/or Google My Business profile shows up at the top of the search results. According to Google, 76 percent of people who search on their smartphones for something nearby, visit a business within a day; and 28 percent of those local searches result in a purchase. Since people are using their phones to search for your products or services and are increasingly likely to make a purchase based on what they discover, it’s paramount that your business profile or website shows up at the top of those search results. If your potential customers don’t see your business listed at or near the top, they will see your competitor’s business. How will you capture new customers if they can’t find you when they need you? Hint hint…you won’t. Long gone are the days when you could just follow Google’s guidelines on optimizing your website and consider your SEO work done. Many of those old-school techniques still work, but they are only a small part of the pie. With the rise in popularity of the Google Maps section on search engine results pages (SERPs), users are discovering much more about local businesses without even having to visit their website. Google itself is absorbing more and more of the top half of the search results with SERP features like the maps section, featured snippets and the Q&A section. And that only includes the “organic” or non-paid section of the results page. The various ad sections consume even more page real estate. I will help your business show up higher on the first page of Google, by optimizing your web presence, not just your website. Ideally, your ideal customer will contact you without even having to visit your website. This may include a “click-to-call” action so they call your phone. Or, it can also include booking an appointment directly from your Google My Business profile page. First, I start with an in-depth SEO audit on your entire web presence, not just your website. I’ll quickly discover the holes in your local SEO. 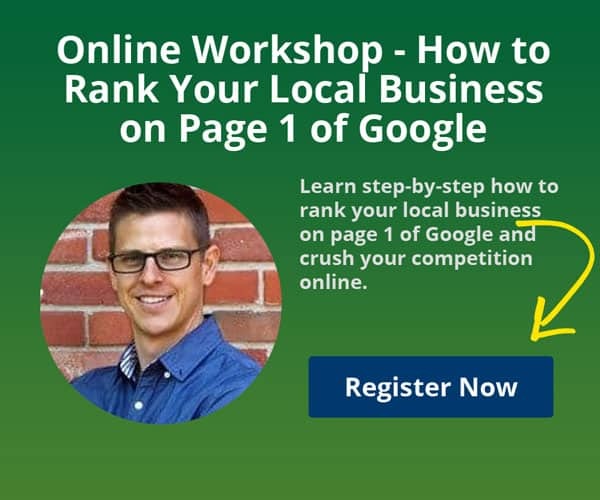 This will help me develop a local SEO roadmap that we can use over the course of the next several months in order to improve your Local SEO. Do you have pages for all your core products and services? Are those pages filled with unique and engaging content your potential customers will find useful and compelling? Do you have separate pages for all your main service areas? Google LOVES unique and engaging content, so let’s make sure your website is full of quality content. Does your website have properly-optimized title and description tags (or do those tags even exist)? Are you using Heading tags properly (H1, H2, etc)? Your home page should have only one H1 tag and the other heading tags should be properly optimized so Google knows exactly what you have to offer. How fast does your website load on both mobile and desktop? I’ll run a speed audit using Google’s Page Speed Insights tool to uncover the technical issues that are slowing your website down and causing you to lose out on a higher ranking on Google. Google has officially moved to a “mobile-first” index. This means Google will look at how your website looks on a mobile phone and consider that when deciding on where to rank your website in relation to your competitors. If your website is not mobile-optimized, Google will penalize you. Do all pages load securely using the https protocol? If your website does not have an SSL installed and configured, you could be losing out on a higher ranking. Do your web pages load with or without the www? Choose one and let Google know about it. Does your website contain links that don’t work? This includes both internal and external links. I’ll scan your site to be sure all links work properly. If your website contains the same content in two or more places, Google might think you are trying to “game the system” to make your website look like it has more content than it really does. I’ll scan your site and let you know if there is any duplicate content issues that could be hurting your ranking. Have you claimed and optimized your Google My Business and Bing Places for Business profiles? Having a properly optimized business profile on Google and Bing will help your business stand out at the right time to the right people. After the one-time, technical SEO is out of the way, I can begin an ongoing Local SEO campaign that focuses on content creation and link building – the bedrocks of strong SEO. Remember when I said Google LOVES content? The more the better. But quality content is more important than quantity. Why? Great question, I’m glad you asked. So to further optimize your website, you need more and more and more (like a never-ending supply) of great content. Great content could include rich, in-depth articles in the form of blog posts. It could be videos or infographics or podcasts. Most high quality content takes the form of in-depth blog posts (like this one), engaging videos or podcasts. The more often you add high quality content to your site, the more Google will take notice and the higher your website will rank (all other things being equal). Speaking of equal, Google had to come up with a way to determine “rank-worthiness” based on 3rd party validation. After all, if everyone could take care of the technical issues on their site and if everyone could add high quality content to their site, how would Google know which result is most relevant for a particular keyword search. A link is simply when another website (that you don’t own or control) places clickable code on their site so users can quickly and easily jump to your site from theirs. The more links you get (generally speaking) and the higher quality those links (think newspapers and large industry-specific sites), the more Google will see you as worthy. It really all comes down to reputation. If you combine high quality content with high quality links, you’ve got a great recipe for a high ranking on Google for that coveted search term. Link building (the right way) can be a long and arduous task. Some links are easy to obtain (directory sites, social media, etc), while other types of links can be near impossible to secure (guest blogging on a large industry site, large news sites, etc). But they can all be helpful in letting Google know that your site is more relevant than your competitors. And one more thing…Google indexes web pages, not necessarily websites. Although the number of pages you have in your website does matter, when a user searches a particular topic, they are usually looking for a single page of information on that topic, so Google serves up their listings based on the particular page on your site it thinks will best serve the user for that particular search terms. Local SEO is not necessarily an easy thing to do (correctly), but if you have the time and skill, you can see positive results in a few weeks to a few months. Most ongoing Local SEO campaigns should be run for at least 6 months before determining effectiveness. If you have any questions about Local SEO or would like me to run an SEO audit on your web presence, hit that button below to begin the process.